On Saturday, October 26, 2013 the National TLC Service held a design charrette at the Figure One Gallery in Champaign, IL to plan the Illinois route of the National Cold War Monuments and Environmental Heritage Trail. 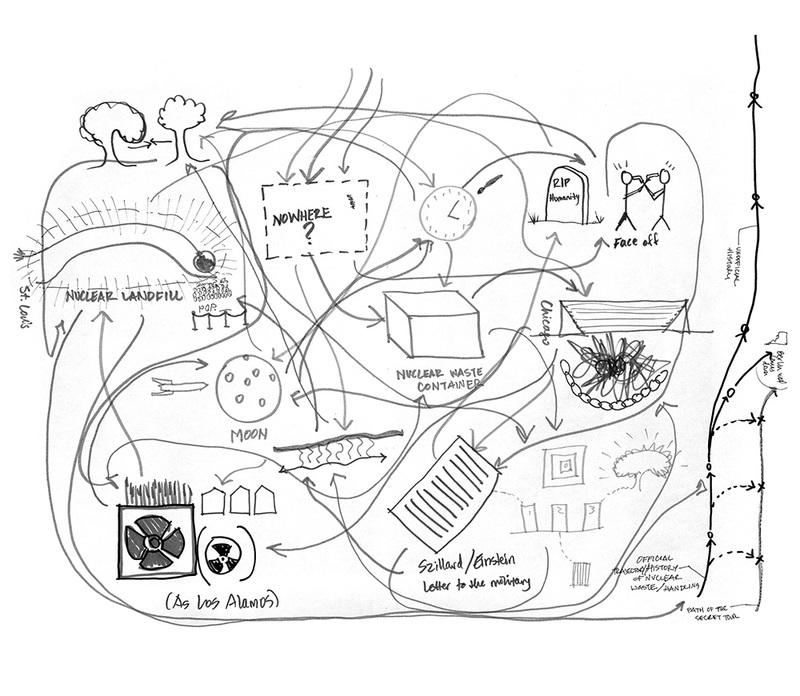 A charrette is a collaborative workshop in which a group of stakeholders and designers collaboratively draft solutions to a problem or issue. 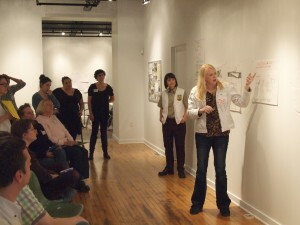 Our charrette included seventeen participants from Champaign-Urbana, Chicago, and the St. Louis area. Through a daylong series of discussions and drawing sessions, the group mapped Illinois atomic geographies; brainstormed ways to represent the conceptual and political issues raised by them; and proposed routes and actions linking regional sites with national and global centers. 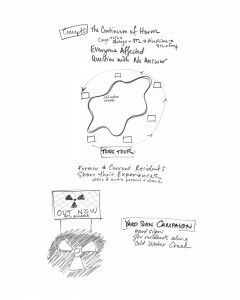 By the conclusion of the day, shifting groups had collaboratively sketched a diverse set of strategies to mark and commemorate the continued presence of nuclear weapons, materials, and wastes in our everyday lives, lands, and bodies. After introductions, the day opened with a session annotating and critiquing the TLC-service generated map of nuclear-affected sites in Illinois and adjacent parts of Missouri, Indiana, Kentucky, and Iowa. 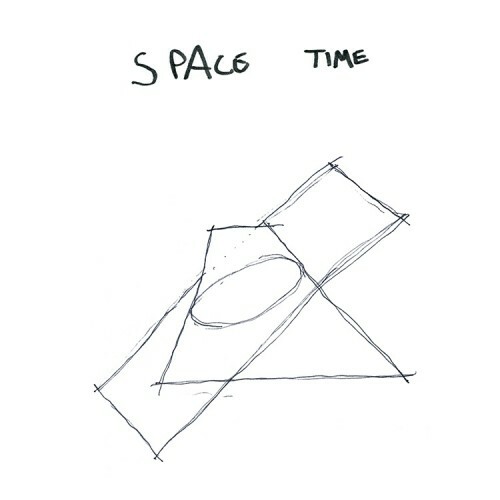 We discussed the limitations of spatial maps in creating connections between temporal and conceptual layers. 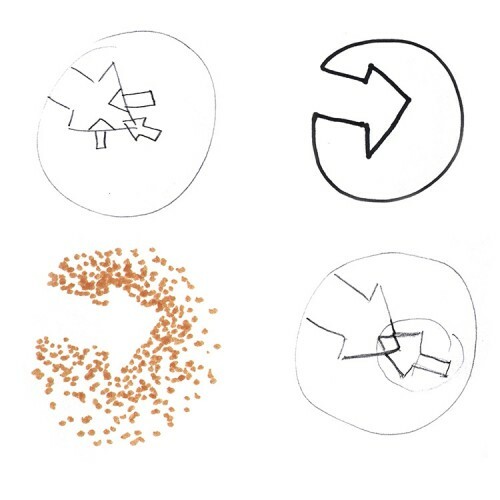 Participants warmed up their drawing and visual thinking skills by proposing an alternate set of map icons that would help to visualize the connections the group had discussed. 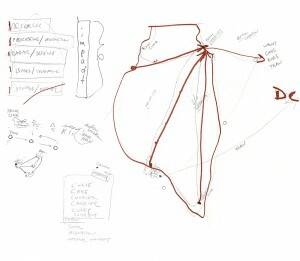 Having discussed the relationships between nuclear weapons sites in Illinois and connections to other histories, times, and ecologies, the group turned their attention to crafting spatial narratives linking multiple sites together in a series of Cold War Environmental Heritage Trail. TLC Service personnel emphasized that these trails should include present-day activities and impacts and include the living and yet-to-come heritage of these technologies and infrastructures. 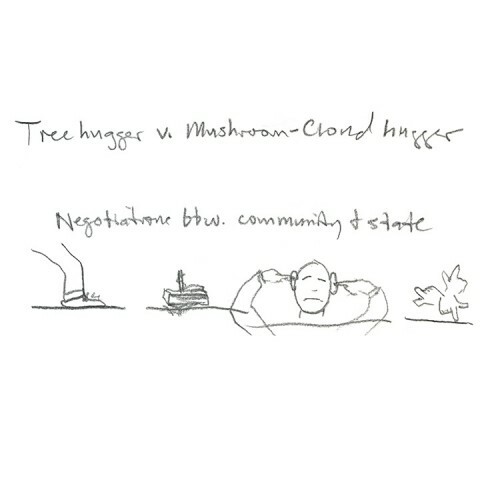 Working in self-selecting small groups, participants developed the following proposals. 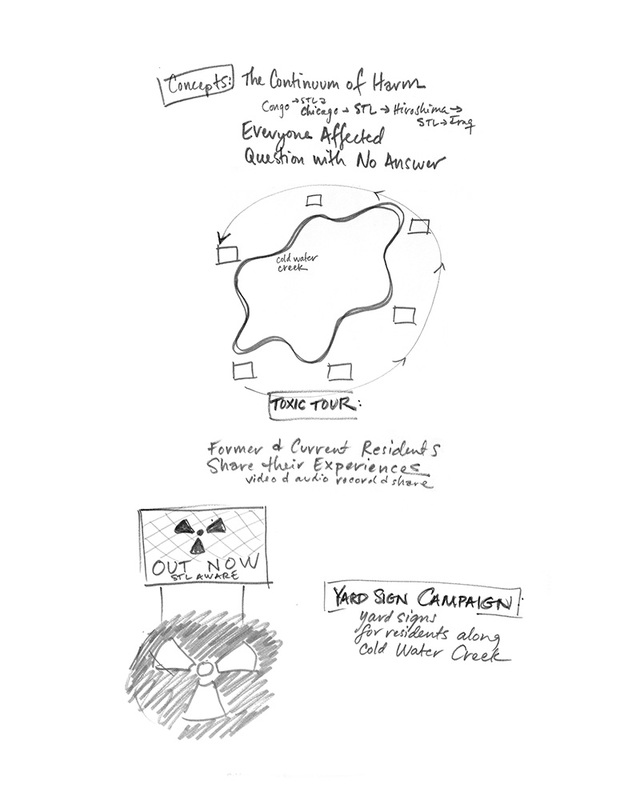 Our small group began by discussing the tangible and intangible properties that a network of nuclear sites represents. 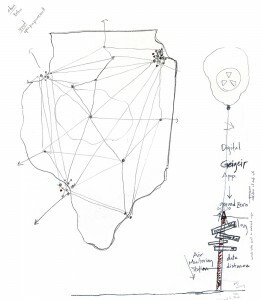 Each site represents a node within a chronology of nuclear history as well as the impacts of that site on ecological and social factors beyond its boundaries. Linking these elements to a geographic scale proved to be complicated because of the complex range of data that needed to be represented. 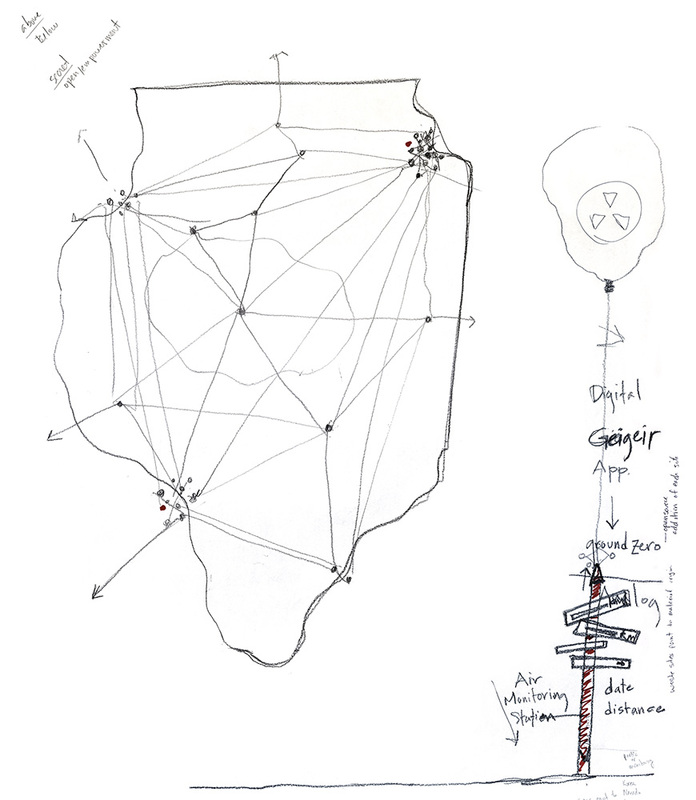 The overall network of sites and the multiple layers of information and interconnections led to the idea that a trail of nuclear sites could exist as a mobile device app. Using that technology, a user could download the program and when traveling the app would alert the user to the proximity of a site. The initial alert would provide basic information and directions to the site. 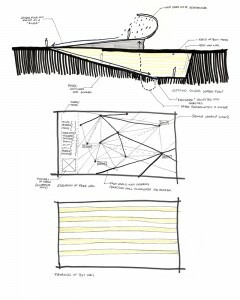 Once at the site, the app would act as a historical and environmental lens to augment and explain the site’s current conditions. 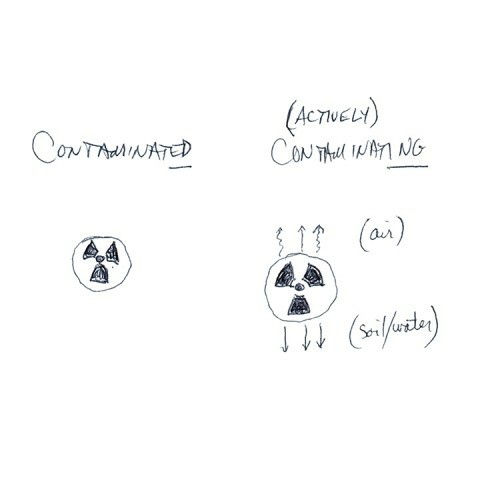 Former buildings would be placed in the scene, types of work that was conducted at the site would be illustrated, and the subsequent environmental effects would be overlaid onto the current setting (imagine seeing a plume of groundwater contamination extending into the distance). Due to the ever-changing nature of technology we also wanted to incorporate an analog component to the nuclear trail network. In that regard, we proposed a sign post for each location that would point the direction and relationship to neighboring sites. With the sign post, we wanted to also physically represent the intangible aspects of nuclear history, in particular fallout and air quality data. To do this, we proposed that the sign posts would also be air monitoring stations that would glow in a range of colors to represent real-time air quality data. 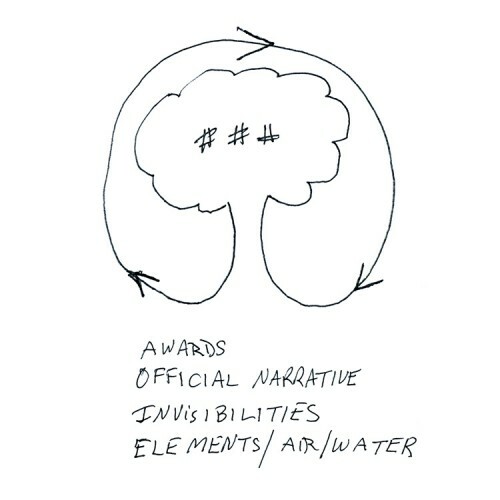 “The Secret History of the Cold War: Cold War as Hyperobject” explores the potential of spontaneous choreography within a related set of information pertaining to America’s nuclear history. Visitors are taken either physically or digitally through a fixed information set, so that each visitor receives the same information but is prompted to form unique cognitive relationships. 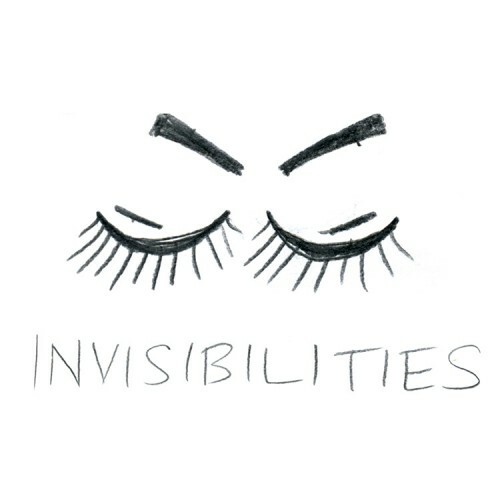 A driving theme of the tour is the conundrum of perceived danger or safety in relationship to invisibility. The only logistically defined stop on the tour, visitors are first taken to “nowhere,” where danger is implied but not certain or seen (as is the case with nuclear fallout). At the tour’s conclusion, visitors are brought to the physical remains of an actual nuclear waste container, where here the visible material object—at one time designed for safety—evokes trepidation. 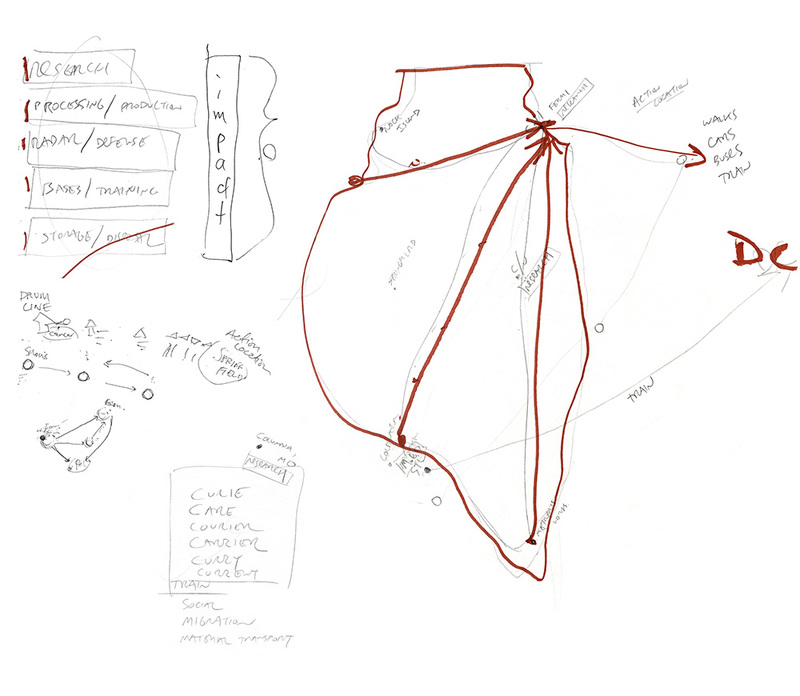 We based our design around the railroad as a space of travel that facilitates social interaction while also prodding us to thought about other “carriers,” modes of transport for materials, people, and waste in the nuclear industry. Our idea imagined three tours based around three AMTRAK spokes across Illinois, converging in Chicago for a joint tour to DC for action and education of legislators and policymakers. One tour would start in St.Louis at the Coldwater Creek site, another farther South at the Metropolis site, and a third at the Rock Island arsenal. Each tour would make stops to move from train to car to foot to visits of other nuclear-related sites in Illinois. Each site would be sure and visit one site each of a few types : Manufacturing, Research, Processing/Waste, Training, and Deployment/Defense. The idea here is to get people seeing sites of different types together, and then sharing stories of their visits with others on the trip from Chicago to DC. Like a drumline formation in New Orleans, the disparate group efforts converge and form a new story, with an emphasis on education the whole way through. Participants then shared and discussed images from a ‘metaphor toolbox’ that they had submitted prior to the event, discussing possible images, gestures, and signs that somehow evoked the nuclear legacy. 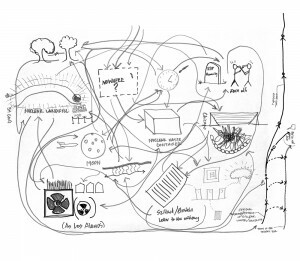 These metaphors set the stage for the final design activity: proposing a monument for the health, environmental, and cultural impacts of atomic weapons and wastes. 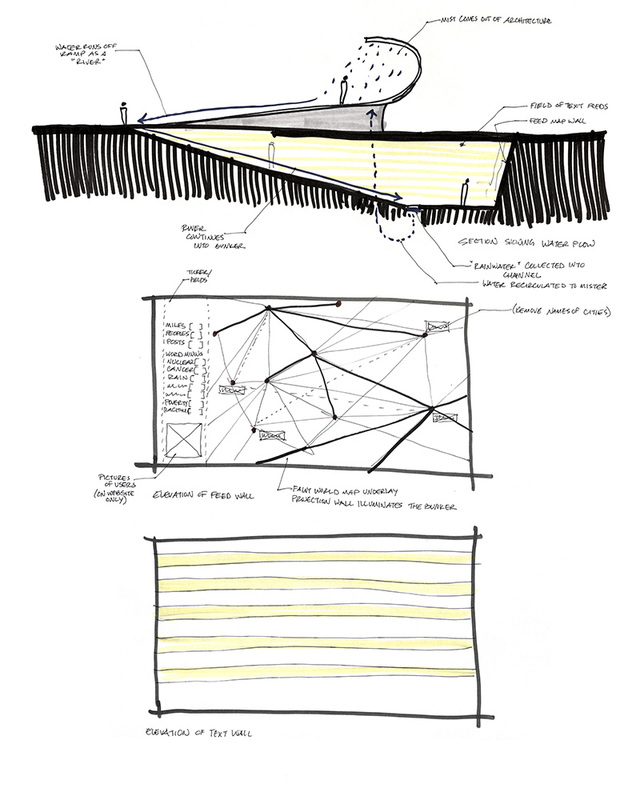 The architecture of this monument is shaped to suggest the cycle of rainwater. 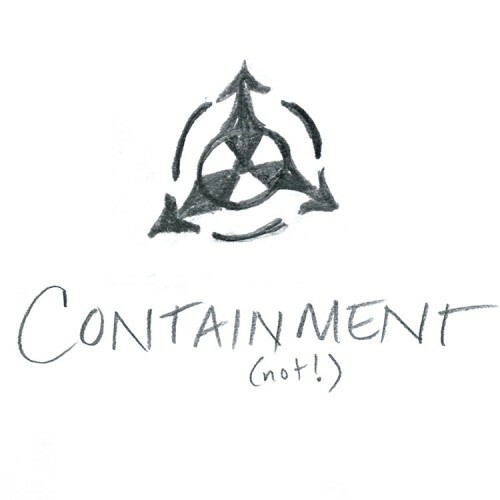 Rain is a potent vector for nuclear contamination effecting both the landscape and people. To commemorate those who were subjected to specifically rainwater-carried fallout, visitors to the monument follow the path of water through the space. A tilted plane touches down at street level, carrying visitors up through a labyrinthine garden space culminating in a misting area–where the rain first falls. This water runs in channelized rivulets down the tilted plane and into the subterranean “bunker” space of the monument. Here, the compression of the dark walls shifts the mood from uplifting to contemplative. Visitors are met with multiple forms of live media feeds which communicate the prevalence and presence of those suffering from exposure to nuclear fallout. A live ticker wall displays thoughts and interpretations sent in by users. At the back wall, a working map and data matrix visualize the incoming information and synthesize it into a comprehensive reflection on the current reality of the world’s nuclear legacy. This mobile monument can be situated in downtowns, galleries, museums, county fairs, protest sites, poling stations – in short, anywhere. 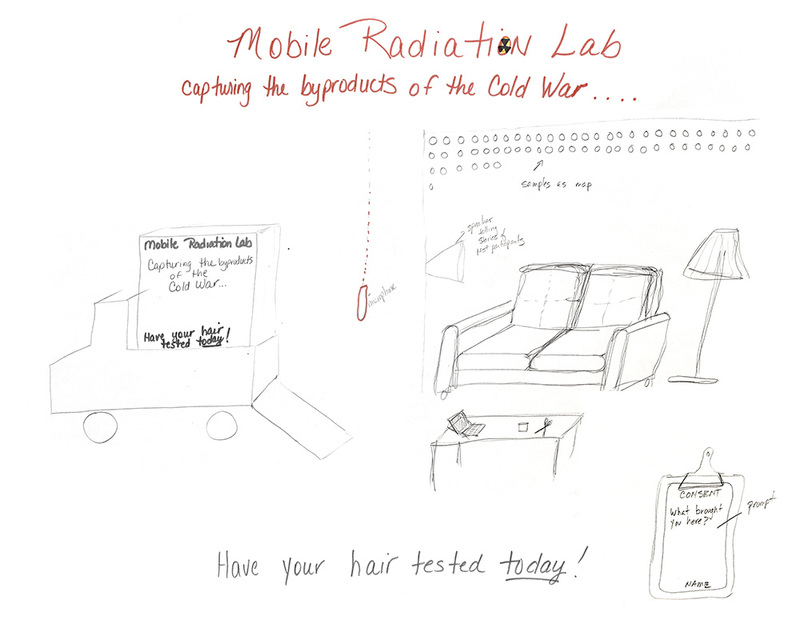 As an ultra-government project, the Mobile Radiation Lab not only tests for heavy metals in hair, but documents personal histories. As the database grows, this allows for more nuanced research on the correlation between toxins, disease and lived experience. This project comes out of the frustration of insufficient documentation on toxins stored in our bodies and with disease classification. Diseases are cataloged by the city and state of diagnosis. 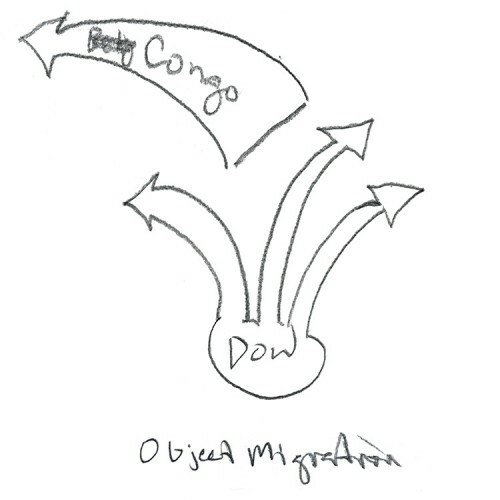 This means that disease clusters caused by proximity to toxic sites are impossible to correlate as families and people migrate over their lifetimes. 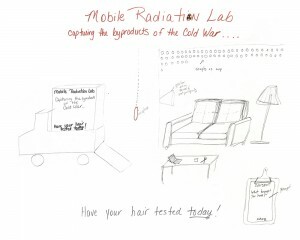 Recognizing that disease, environment and storytelling are enmeshed, the Mobile Radiation Lab works to collects narrative and statistical data. 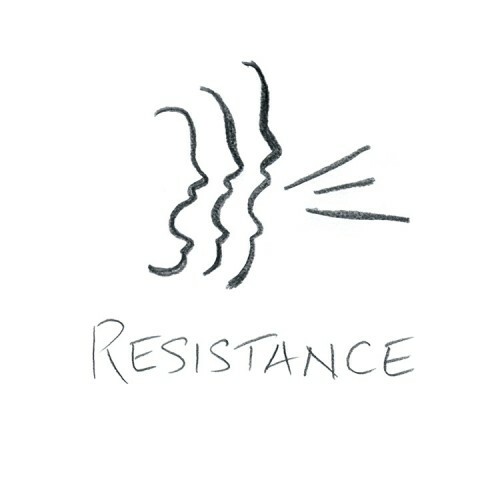 During a fascinated interview, personal histories will be archived, hair samples taken and a personal story recorded. The stories begin with the question, “What brought you here?” The narratives continuously loop within the room. 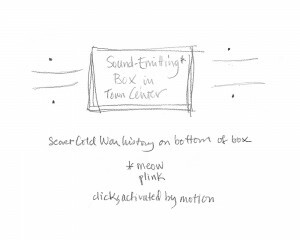 (1) A curious block of solid stone from which sounds at times emit, including a cat’s meow, a Geiger counter ticking, and a clock-like “plink” as if time is advancing, along with other bemusing sounds (perhaps occasionally the block laughs). 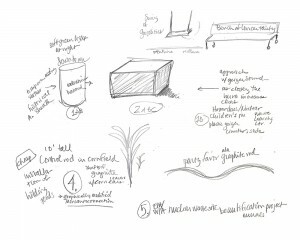 On one side, a movable bench on rails labeled “THE BENCH OF UNCERTAINTY” provides a place to sit, closer or further from the block as people wish. At either end of the block, as well, are two swings, with the backs to the block. People my sit and swing on them; these are labeled the “SWINGS OF GEOPOLITICS”. 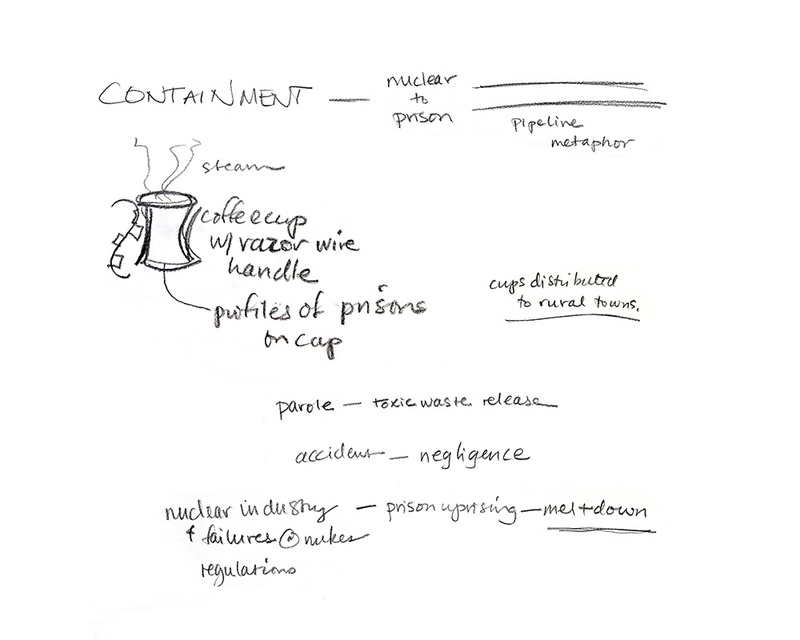 (2) A complimentary coffee mug, shaped like a reactor cooling tower and with a barbed-wire wrapped handle, each emblazed with one of the Illinois State Penitentiaries on it (collect them all!). 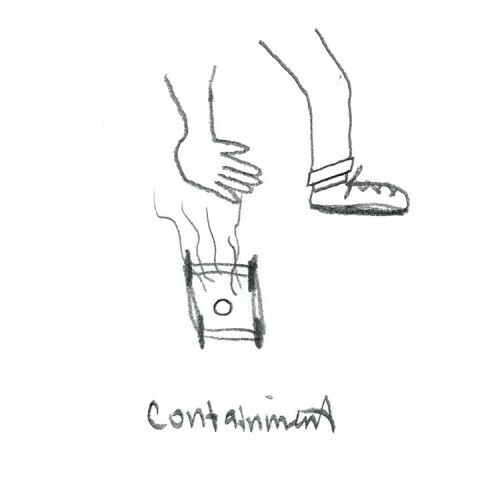 (3) A large nuclear waste containment vessel, designed for scientifically informative and interactive fun with the kids. This includes hand-held, obviously fake Geiger counters that users can click faster and faster as they get closer and closer to the waste vessel. 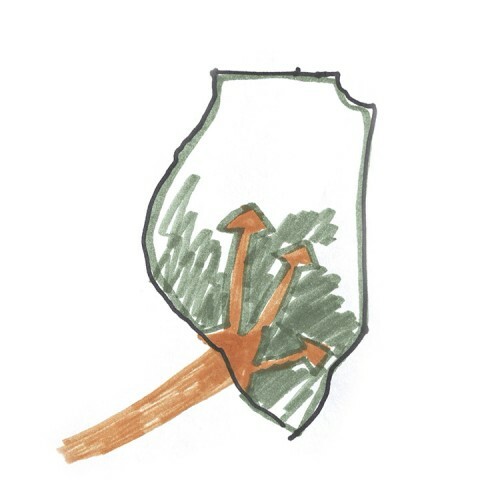 (4) As kind of variation of three, there is a hollow, “sheath-like” covering that one can slip over various existing public statues (of Abraham Lincoln, U of I’s Alma Mater, &c) as a gesture of containment and the myth thereof. (5) This monument is the most deceptively subversive. On the notion that most public art funded and purchased by municipalities tends to be hopelessly abstract, because it has the least meaning (in theory) and thus the least capacity to offend, we propose a single thick, tall column of graphite (or something that looks like graphite, if graphite is expensive at that scale). While this resembles the monolith from 2001 or the center of a No. 2 pencil, it actually stands for the control rod in a nuclear reactor. On top of the column (2’ across, 15’ high) is a short figure holding an ax near a rope. I would especially try to promote this monument is a state-wide gesture of municipal pride, telling the city’s stewards that this sort of thing (like a prison, like a nuclear reactor, but this would be left out of the proposal) should generate income for the town, &c. It would be a secret of the Cold War what the columns really signified. Done with proper stealth, cities could actually be duped into erecting these monuments, I’d think, which is symbolically exactly right. (6) Lastly, as an overt and open variation of no. 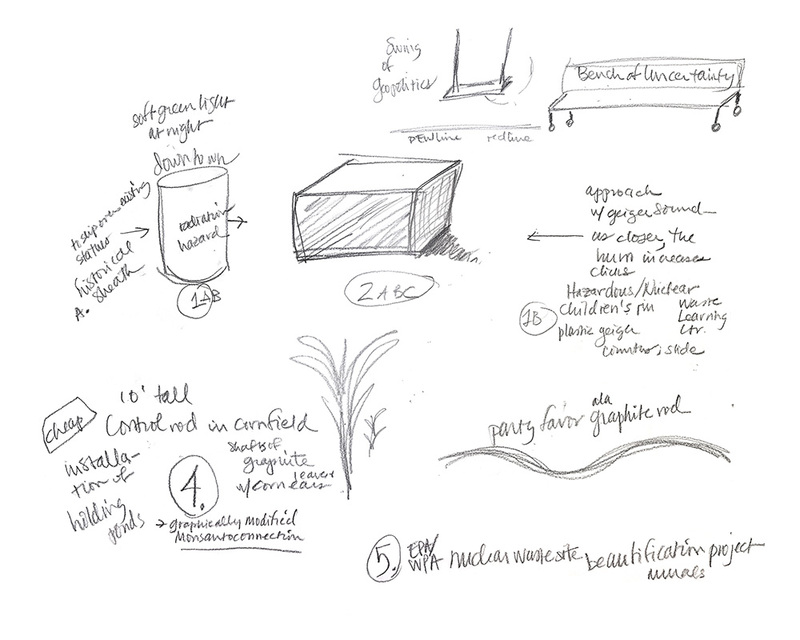 5, an entire acre of fallout-affected soil, with corn, would be planted with columnar graphite poles, each with dark green corn leaves and ears of corn sticking out. They would be planted in the earth in straight rows. This overt protest could link with a protest against Monsanto. Developing a monument strategy was a continuation of one of the small group’s trail development efforts. 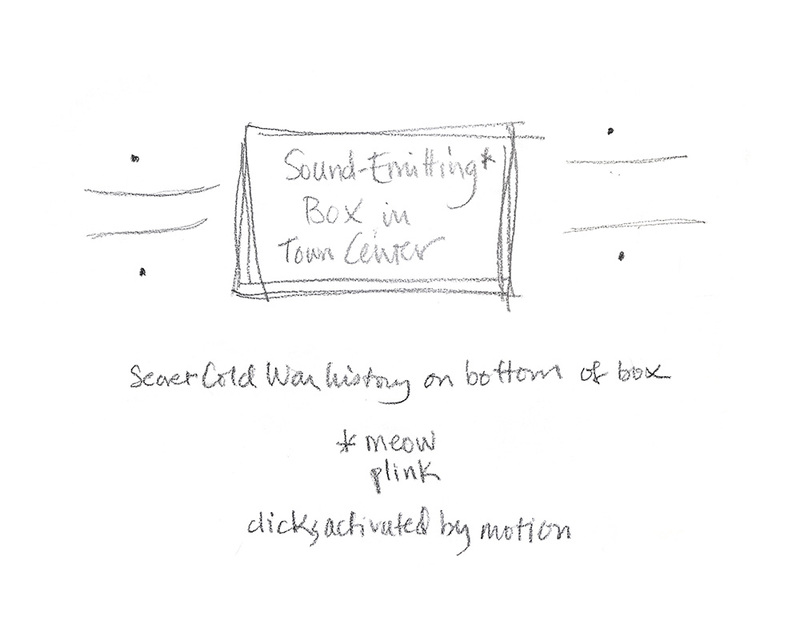 Because our trail proposal relied heavily on technology, as a counter-point we wanted to develop an analog system for monuments. 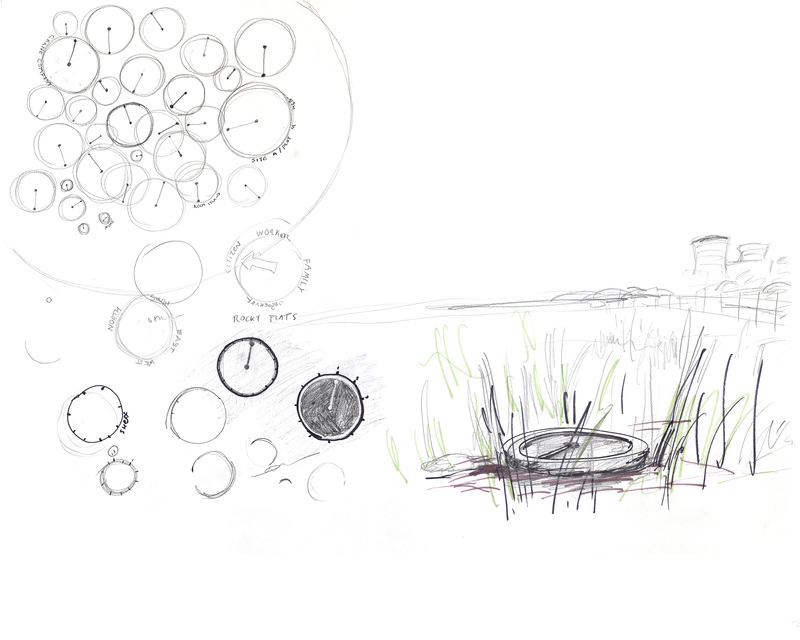 We began exploring the idea of visitors taking something from each site. From this conversation we designed a system of brass markers, much like USGS datum points, that could be easily and discretely deployed at each site. 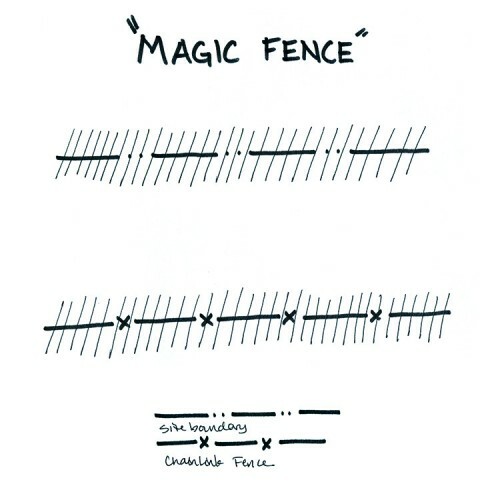 From these markers, visitors could make a graphite rubbing that would be scaled and oriented according to the importance, chronology, and use of the site. 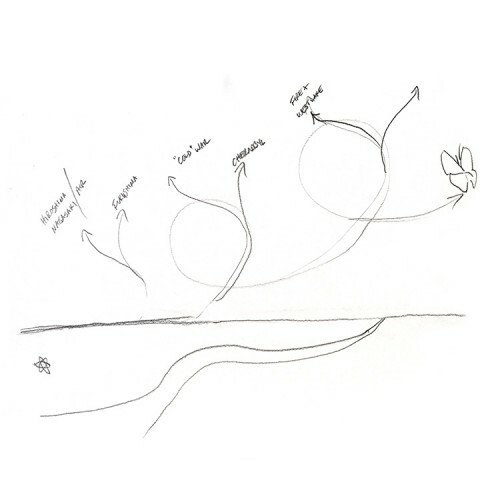 Distributing the knowledge of the markers would occur through a website where users could send away for the official rubbing form onto which they can collect rubbings from all of the sites. Danielle Chynoweth, Beth Pross, and Susan Folle worked together to design a monument that would also serve as a public awareness campaign for the problem of Manhattan Project waste contamination in St. Louis. 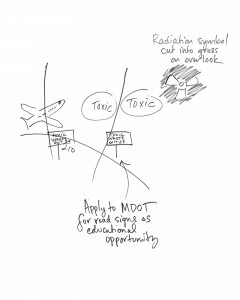 The campaign would involve toxic tours, yard signs, highway cleanup sponsorship, and a giant radiation symbol cut in the grass near the airport (which is adjacent to the waste) so that all plane passengers would see it. The cooling tower as coffee cup is a “nonument” that is small in scale, easily replicated, and available to distribute widely. 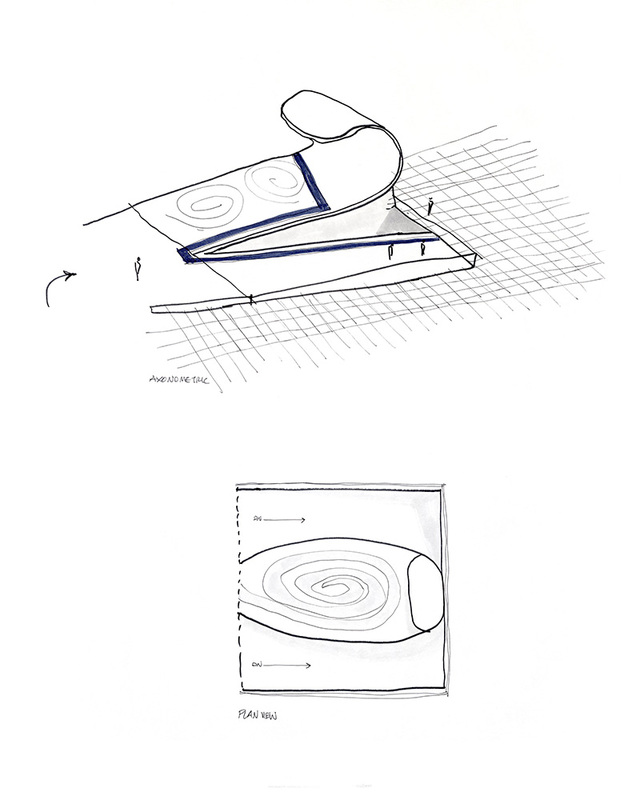 The shape will be the hyperbolic paraboloid of atomic energy plants, with steam from hot drinks rising from the cup. The handle will be of simulated razor wire to remind the user of the ever-present dangers of nuclear reactions and their aftermath. 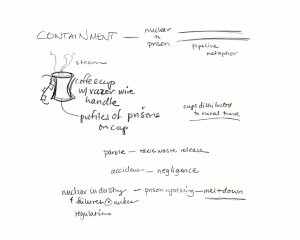 On the exterior of every mug (“collect them all!”) will be an imprint of a different plan or view of an Illinois prison (state or federal) and its location. 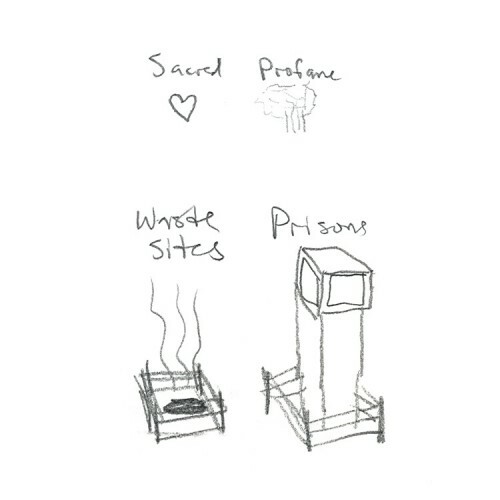 Prisons and nuclear by-products are toxic to our environment, including the people associated with them, of course. Under the guise of providing jobs, prisons and atomic energy sites are often located in poor, rural areas of the state. In recognition of these “awards” for toxic jobs and prison complexes, the mugs could be displayed in a “trophy case” in town halls across the state. An exhibition of the materials generated during the charrette is on display in the Figure One Gallery in downtown Champaign through November 27. 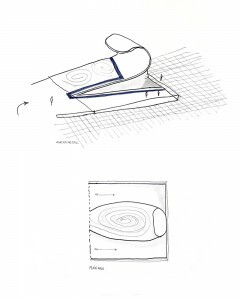 The National TLC Service is working on a booklet/catalog of designs generated during the Illinois charrette. The catalog will be downloadable as a PDF from this site, so be sure to check back soon. Thanks to all who gave their time, intelligence, and creativity to the event!